Box Text: Take to the skies and let the battle begin. 1995: The principality of Belka invades neighbouring Ustio, sparking the brutal Belkan War. Hopelessly outgunned and quickly overrun, Ustio's last hope is their mercenary air force. You and your wingman soar into the skies to face the might Belkan Air Force. A nation's hope rests on your shoulders. Don't let them down. 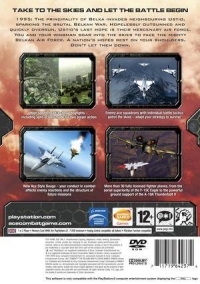 - High speed, head to head dogfights, including split-screen mode for two player action. - Enemy ace squadrons with individual battle tactics patrol the skies - adapt your strategy to survive. - New Ace Style Gauge - your conduct in combat affects enemy reactions and the structure of future missions. 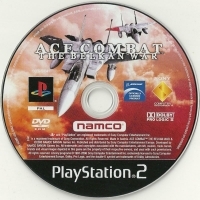 This is a list of VGCollect users who have Ace Combat: The Belkan War in their Collection. This is a list of VGCollect users who have Ace Combat: The Belkan War in their Sell List. 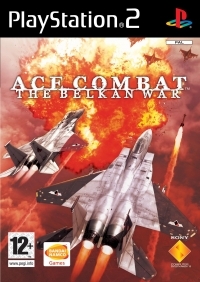 This is a list of VGCollect users who have Ace Combat: The Belkan War in their Wish List.